On March 10 2016, our lives changed forever. Our little apricot and white labradoodle, Bailee, came into our lives. She was a real trooper flying all the way from Whitehorse, Yukon to Vancouver to meet her new Mom and continue the journey back up to Kitimat, BC. We arrived home after midnight to meet a very happy new Dad. We are so proud of our little girl. After only 6 nights she was sleeping thru the night and had adapted to her kennel. She was pretty much trained on her arrival, she just had to work on teaching her new parents to pay attention. After a month, she was able to use the poochie bell and let us know when she wanted to go outside. She is a sweet natured girl who loves people and other dogs. She is energetic and inquisitive and loves our large back yard. A forested section has become known as Bailee’s Forest. She has encountered toads, killed a mouse (my hero). chased birds and squirrels. A coyote was in the back yard but she ran home when Mom got a little excited and starting yelling. She is learning that bees are not to be chased, after being stung in the paw. Bailee loves water and chases the water while I water the plants, plays in her pool and attacks the sprinkler systems when we’re not looking. I’m looking forward to taking her in the kayak with me later this summer. She loves playing with her soccer ball and wrestles with her toys. She is a cuddlepuss and loves to laze in the morning cuddling and having her tummy rubbed. Much of our little girl’s behaviour is due to the very healthy and stimulated early beginnings she had with Gina and her family. We were so impressed with Gina’s professional blog and her dedication to ensuring that her puppies are matched with loving and caring families. The entire extended family looked forward to our weekly pictures and Gina forwarded much needed and appreciated information for preparing for our new arrival. Can’t tell you how often I’ve returned to the info to clarify. Her desensitization efforts have helped us with the introduction of the lawn mower, tractor and quads. She is quick to respond to questions and will help in any way she can. After giving the puppies a temperament test, she matches the puppies with her hopeful families. As a retired couple we know without any doubt that Bailee was our “meant to be” puppy. We are so happy that our nephew introduced us to Gina’s site and that we brought home such a wonderful, funny little girl that fills our days with laughter. Thanks Gina for all you do. 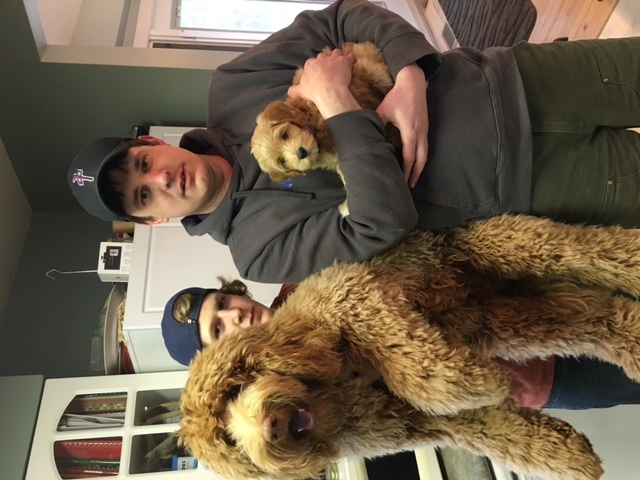 You have an amazing job and a family that is devoted to filling other peoples lives with healthy, happy and loving labradoodles. Your kids are growing up , I’ve gotten older, and my Buddy (Willow’s brother) is what six and a half now? I’d have to check, but he is an old man I guess. I just had to share this pic with you. Age has only mellowed Buddy, if that was possible. We are now on our eight grandchild, and she is a fierce warrior of a kid at ten months old. I watch her full time M-F and her first word is dog. She is obsessed with Bud. She uses him as a climbing post , grabs his beard, stands with him, pokes at him, pinches him, loves on him, and follows him all over the house. He is clearly annoyed sometimes, but just walks away. Mostly though, he stands patiently and let’s her do what she needs to do = does not leave while she is standing or holding on to him, will not let her fall. He is the kindest sweetest, healthiest, most loving dog of all time. Yesterday, with the baby in a stroller and bud on a leash, we were out walking. We came across a frantic woman and her two daughters who were out trying to find a runaway jack russell terrier (who was crazy). We kept seeing the terrier race across the street and run like he was insane. He came running over to where we were, I calmly took bud off his leash (because he is completely off leash trained) and he stood patiently greeting this strange and crazy dog so that his owner could come and capture him. He gave me this look like, “kids these days”. We proudly and calmly walked back home. I hope you are well and thriving in your northern home. Thanks again for my amazing dog. We love our puppy, Bailey, so much! Ever since we brought her home she has become a loving member of our family. Everything we do includes Bailey, and we love every minute of it. I myself have wanted a dog ever since I knew the word, and the fifteen years of waiting has paid off. Bailey is the best dog in the world and a perfect match for my family. Now, I never have to stay home alone again because I have my best friend Bailey to snuggle with and to play with. I can’t express how thankful I am for her. Thank you so much Gina! As a way to show you how much fun we, and her, are having I created a short little montage for you! Have a great rest of the summer! I just wanted to send you an updated picture of Bentlee. He is our pride and joy beyond anything we ever expected. If there was ever a perfect dog it is him. Bentlee is soooooo gentle and sweet natured. and…..I have only heard him bark maybe 3 times. He is very quiet. What a guy! We just adore him. I am sending you a 5 month picture of him. Thank you also for your professionalism with your business. If ever you need a reference please let me know. I have told at least 10 people you website address. Everywhere we go people want to know what kind of dog Bentlee is and how do they get one. We sing your praises. Oh and by the way…I love this dog so much I don’t care how big or small he is. He is the perfect fit for us! Eli (and friends and family). We couldn’t be happier with this little guy. toy and running around the back yard. wants a Doodle I will send them your way. Wow! If I wasn’t impressed with your organization and Labradoodle expertise before, I came away from your home, thoroughly impressed. From the immaculate condition of your home and yard, the quiet music in the background, the wonderful chocolate-chip/banana muffins, to the obviously happy and healthy dogs, your quiet children, David, who came out to greet us. (but then he disappeared)…to my perfect puppy, Katie, I was amazed and quite pleased. Though I don’t know anyone currently looking for a Labradoodle, I will have absolutely no hesitation recommending you and your dogs, should an inquiry be directed to me. I want to thank you for helping us find the perfect dog. You were wonderful from the very beginning, when I was just starting to research Labradoodles. You answered all of my questions and made me feel welcome. You addressed all of my concerns and let me take my time making a decision. I knew from the start that when I decided to get a new dog, it would definitely be from you. When I finally decided that I was ready, you made the process very easy for me and my family. I knew right when I met Cheech that he was the dog for me. I fell in love with him instantly! The transition to his new home was very easy. He was almost housebroken already when we got him. I love him more and more each day, and I look forward to seeing what he will do next. Thank you again for being so helpful. I know that I can always come to you for advice, and I will be! I would recommend you to anyone who is looking for a Labradoodle! I want to take a moment to thank you for our Buddy. After speaking with breeders across the country, my decision to get a puppy from Arborgate has proven to be the right choice in so many ways. First and foremost Buddy is without a doubt the most balanced, sweet- natured and engaged pup I have ever owned, and as you know, I have raised many well-bred pups over the years. He is truly special. He is so smart, trainable, loving and great with my grandkids! Working with you specifically Gina, has been a blessing. You were so patient and helpful while I was getting to know about the Australian Labradoodle breed, and I had sooo many questions! Your involvement in helping to choose the pup that worked with my lifestyle, making sure I had all the facts to make an informed decision, and sending information about how to be prepared for Buddy’s arrival was invaluable. The shipping process was easy and painless. Now that Buddy is here and growing, I appreciate staying connected to you at Arborgate and other puppy families so we may all compare notes about our puppies progress. Sharing pictures is a bonus! I wish we were geographically closer so we could get to know one another better. I also still hope to convince my kids to get a puppy from Sadie’s last litter, or to perhaps consider adopting Sadie herself. If you ever need a personal reference, you can count on me. Jim and I just want to express our total appreciation for all that ArborGate Labradoodles has done for us and continues to do. We brought our precious Elly home 5 weeks ago today. We have totally fallen for her as has anyone else who meets her. She is so smart and tries so hard to please. The time leading up to bringing Elly home was so exciting and Gina was the person that instilled and kept nourishing that excitement. ArborGate’s website draws you in and what they say is what they do. We had the opportunity to visit a couple of weeks before we brought Elly home and it was so helpful to meet them, Elly’s parents and see the way they nourish and love the puppies. We were sold!!! Gina continues to be there for us whenever we have questions. If ever anyone wants an Australian Labradoodle, this would be the place to go! 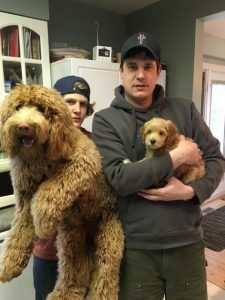 Thank you so much for bringing all the joy of a labradoodle puppy to our family. Maple, our sweet chocolate girl, has been a part of our family for more than 3 weeks now. As first time dog owners we needed help with EVERYTHING! And you were there every step of the way. We had so many questions and concerns, but you guided us along the way with patience and wisdom. Thank you! Your website is chock full of helpful information which we poured over during our decision making process. Even before we had decided on bringing a labradoodle puppy home for Christmas, you were so helpful with pressure-free advice and answers to all of our questions. 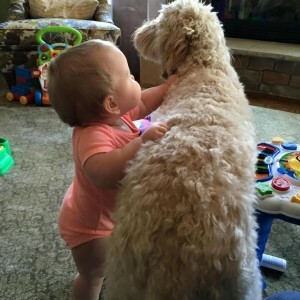 Once we were sure this was the right time to bring a puppy into our family, we loved the weekly updates you sent of our “little girl.” Our children couldn’t wait for the new pictures that you so regularly posted. And the resource materials were invaluable to us as we soaked in everything we could before puppy came home. Since we were importing our puppy into Canada we needed even more help with all the details of the appropriate documentation and paperwork, the booking of international flights, finding an approved carrier, etc. and with your expert help, everything went perfectly smoothly through the whole process. Our puppy really did come out with her tail wagging, ready to meet her forever family. We just wanted to thank you again for everything. We are so happy with every aspect of our experience with Arborgate Labradoodles. PS We just had to let your know that after only 1 week home Maple has been regularly sleeping through the night and after only 2 weeks she has been completely house-trained. We love those “poochie bells” you suggested! She is such a smart girl! I’m writing to convey our complete satisfaction in adopting our wonderful mini Australian Labradoodle. As you know, we did a thorough investigation of breeders throughout the country before we put our faith in you as a breeder. You have been extremely helpful throughout the entire adoption process by keeping us abreast of our puppy’s progress, sending pictures, distributing educational information on raising a puppy, etc. Your website is extremely user-friendly and has a wealth of helpful information about Australian Labradoodles. They are a great breed for many reasons, particularly the non-shedding qualities and the family-friendly factor. It was important enough to us to visit you in Indiana to meet your ENTIRE family, husband, kids, and dogs…We felt welcomed and honored to meet Brouno’s biological parents. You can be assured that we are now lifetime members of your extended family. I’m singing your praises to all of our family and friends, so don’t be surprised if you start receiving inquiries about future litters. Thanks for all of your support in making our life decision an easy one! !